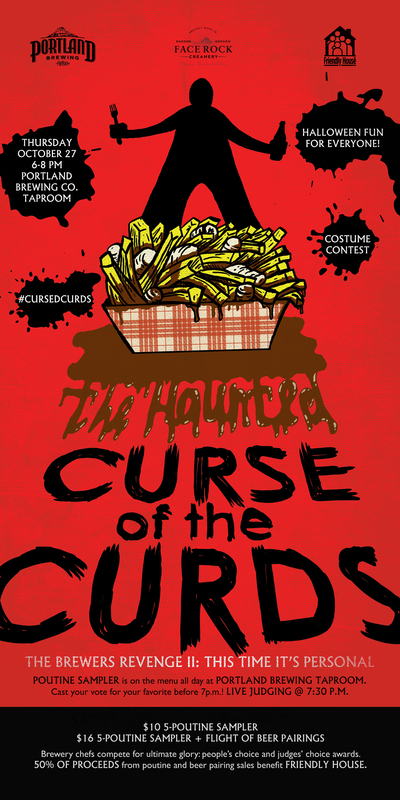 PORTLAND, Ore. (Oct. 06, 2016) — Face Rock Creamery is teaming up with Portland’s favorite breweries to kick off Halloween weekend with The Curse of the Haunted Curds — a spooky chef poutine competition benefitting a local charity. The competition, now in its third year, invites five brewery chefs to throw down their twisted take on this classic dish. French fries, beer-infused gravy, and Face Rock’s Vampire Slayer cheese curds will form the base of each new poutine recipe. Hosted at the Portland Brewing Company Taproom, The Curse of the Haunted Curds: Brewers’ Revenge II competition will take place on Thursday, October 27 from 6-8 p.m.
On October 27, between 11 a.m. and 7 p.m., just before the live judging, diners at the Portland Brewing Company taproom will be able to order a 5-poutine sampler for $10, or add beer pairings for a total of $16. Guests who purchase a sampler are invited to cast their vote for the “People’s Choice Award,” which will be announced at 7:30 pm., during the poutine competition. Half of all poutine and beer pairing proceeds will go to Friendly House, a local organization that offers programs to connect “people of all ages and backgrounds through quality educational, recreational, and other life-sustaining services.” Face Rock Creamery will match the donation. This year’s competing chefs all hail from breweries — Portland Brewing Company, Deschutes Brewery, Breakside Brewing, Sasquatch Brewing, and Rogue Ales & Spirits. They must use one of their beers in their gravy concoction. During the evening competition, the judging panel will decide which chef will survive the curse. Another Portland favorite, KGW’s Cassidy Quinn, will MC the event. Portland Brewing’s chef Brian Arnest is back to defend his judges’ choice title. Last year, he won for “Edgar Allen Poutine” — a chicken chili with Andouille gravy made with BlackWatch Cream Porter. “Producing ingredients that inspire fun and creativity in chefs and home cooks is what Face Rock Creamery is all about,” says Face Rock Creamery President, Greg Drobot. “Good food is serious business, but it’s important to have fun, and give back at an event like The Curse of the Haunted Curds.” To follow all the Halloween fun, search #curdlove and #cursedcurds on social media. Launched in May, 2013, Face Rock Creamery is an award-winning creamery that makes hand-made fine cheddar and fromage blanc. Based in the southern coastal town of Bandon, Oregon, a town that has made cheese since the 1880s, Face Rock sources grass-fed cow’s milk from Oregon dairy families, which allows the creamery to make cheese the same day the cows are milked. Visitors to the 9,000 sq. ft. creamery can view the cheese making process, sample cheese, dine from a seasonal café menu and shop for artisanal products selected with both picnics and more formal gatherings in mind. Face Rock cheese is available at the creamery, nationally at facerockcreamery.com and in more than 3,000 stores. For more information about Face Rock Creamery, head to its website, Facebook, Instagram, and Twitter. Celebrating 30 years of passionate brewing in the Rose City, Portland Brewing looks ahead to a future of unwavering obsession over what our civilized world simply can’t live without: great beer. Founded in 1986, the brewery is one of Portland’s craft brewing pioneers and remains committed to the city for which it is named. Portland Brewing is located at 2730 NW 31st Ave., Portland, OR 97210. For more information about Portland Brewing Company, head to its website, Facebook and Twitter. Friendly House is a non-profit neighborhood center and social service agency, founded in 1930. Its programs and services are provided at no charge or on a sliding fee scale to ensure access to all members of the community. Friendly House provides a continuum of services in three program areas: Children’s Programs, Community Recreation and Education, and Community Services. For more information about Friendly House, head to its website or Facebook.